GENEVA Who buys a $3.9 million car? Not you. Lamborghini's run of the new Veneno is sold out - though it only made three. The latest in its tradition of bespoke cars, the Veneno is the fastest, most powerful Lamborghini ever built. At the Geneva Motor Show, where it was revealed Monday night, Lamborghini CEO Stephan Winkelmann made sure to rev the engine as he drove the car out on stage. Rest assured, the Veneno, which is named for an infamous fighting bull, sounds like a Lamborghini. But why build a car for just three people? "It gives you a high degree of freedom in terms of the design, you can test materials and new technologies, it has a halo effect on the other products," said Winkelmann. "Last but not least, you're fulfilling dreams, at least for a few people." A carmaker like Lamborghini isn't immune from the travails of the economy, but sales of high-end cars, like many luxury products, have been surprisingly resilient. And a one-off like the Veneno creates a lot of buzz - or a halo - for the rest of the brand. Lamborghini is also part of the highly successful Volkswagen Group, which is weathering the European storm better than others. Two of the buyers - both Americans - were in Geneva to get their first look at the car, having signed the contract long ago. Antoine Dominic, who is the principal in a Lamborghini dealership on Long Island, and Kris Singh II, a Floridian who is the managing director of investment firm Tequesta Investments, both have collections of exotic cars and both plan to actually use the car. Powering the Veneno is a 12-cylinder engine and a 7-speed transmission with five different driving modes. 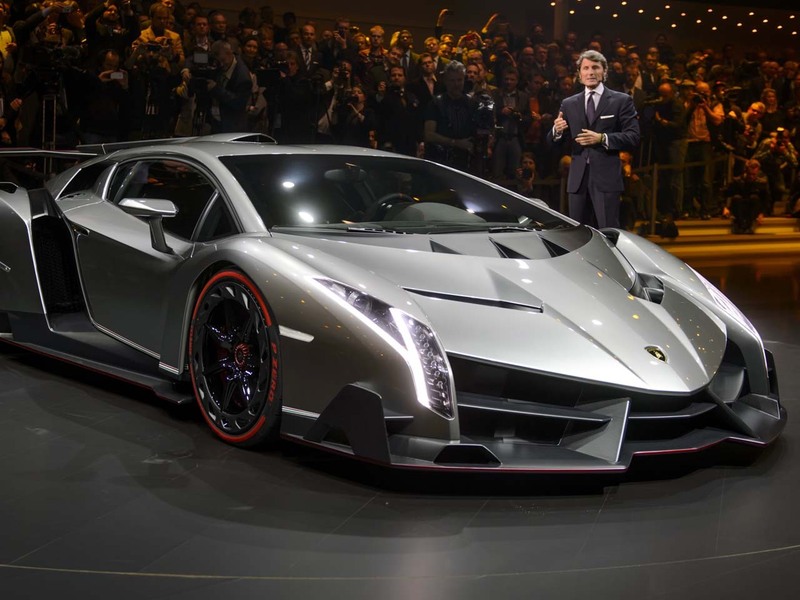 Lamborghini says the Veneno can reach speeds of 220 miles per hour and accelerates from 0-60 mph in 2.8 seconds. The body is carbon-fiber to keep the car as light as possible and allow for that quick acceleration. The shape is angular and muscular, with cut-outs sprinkled throughout and a back fin that fades into the roof. The rear looks like the bottom of a rocket ship, and the car nearly kisses the ground it sits so low. Scissor doors open up to reveal an interior also clad in carbon-fiber. The feel is suede-like throughout, but the dashboard has a fairly standard look. You don't feel as if you're about to take off. The customers are thrilled - though they have yet to actually get behind the wheel. "It's rolling artwork, it's like owning the Mona Lisa," said Singh. "I look forward to driving it." Dominic said that can be hard since it turns so many heads. He plans to take it out at 5 a.m. on a Sunday when he finally gets it. Lamborghini is billing the Veneno as a race car that just happens to be street legal - but how closely they've hewn to racing technology is unclear. "It sounds like they're trying to use the cache of a racing vehicle but not go the whole way," said Paul Newton, an analyst with I.H.S. Automotive.